I have only seen 2 in the wild, so they must be more rare than pops! 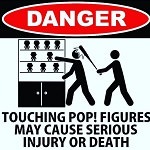 MiniPop wrote: I'm curious as well. I've only ever seen the stranger things chases ( have will and eleven, missing demogorgon). I know the mortal kombat line has chases as well but I haven't come across any yet. I got the chase Darkwing Duck from the Disney afternoon action figure line! It’s pretty sweet! I had to go look up pics for that. He looks pretty cool! Never found a chase reaction figure yet in store. i hate chases are 1/6, they use to be 1/36 and the value would be great. Chases are now so easy to come by. I less than 10 in my collection but that's cause its rare to find them in NY unless you are a true hunter and getting on line early in the morning for drops. I haven't found a chase figure yet. Oh dang I didn't know they were making chases for the action figures.